Italian cuisine has always fascinated me and as much as I love it, I must admit my knowledge about it is quite limited. For more than a year now, I have been following Giulia's blog Juls Kitchen, who blog's from the beautiful Tuscany, bringing authentic Italian recipes to the virtual world. She is also the author of the cookbook My Grandma's Recipes featuring classic recipes of the Tuscan culinary tradition. 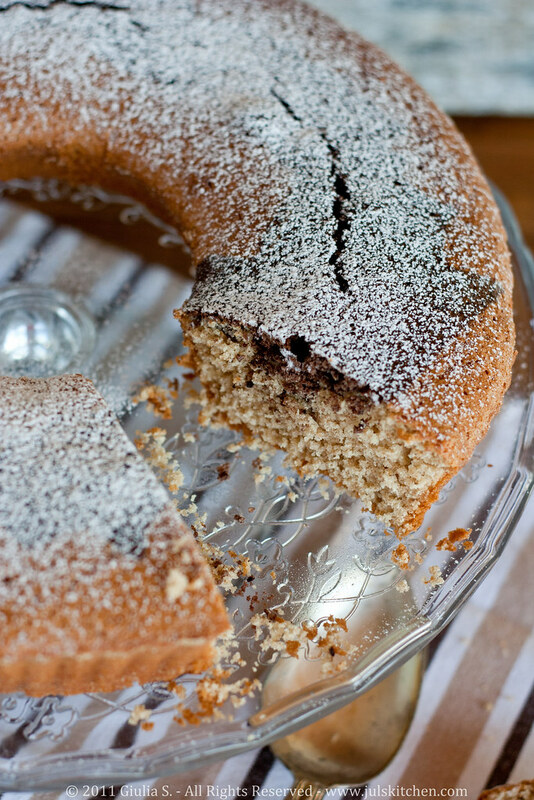 I'm so happy she is on Journey Kitchen to share a fabulous homey and traditional Italian cake with us. I have been admiring Kulsum's blog for months, in love with her Indian recipes, with that Middle Easter hint that makes her tasty dishes even more interesting and appealing. How have I been able to meet Kulsum, born and brought up an Indian Bohra household in Kuwait? Twitter is the answer, and the reason I'm here today with a guest post regarding the Italian breakfast! 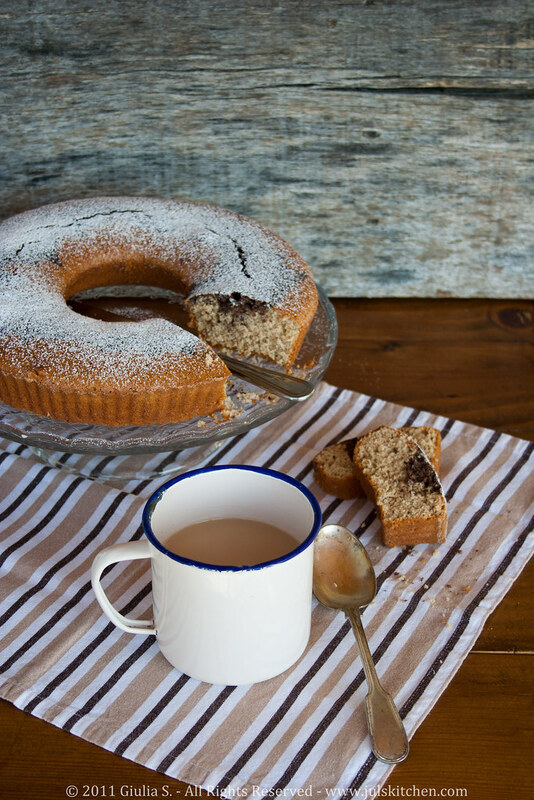 As a grown-up, my daily breakfast is now a cup of jasmine green tea with two slices of toasted bread and a translucent spread of home made jam, but as a child I adored the ciambellone, our home made and rustic ring cake, a classic of many Italian family breakfasts. This is not a fancy cake, you won't see this golden brown ring cake in a patisserie window next to glossy macarons and deep chocolate masterpieces. Tough, I assure you that you can find it on a morning breakfast table in many Italian houses, lovingly sliced by the caring hands of mothers for their sleepy children, or generously spread with home made fruit jam by hungry students ready to face a new day. 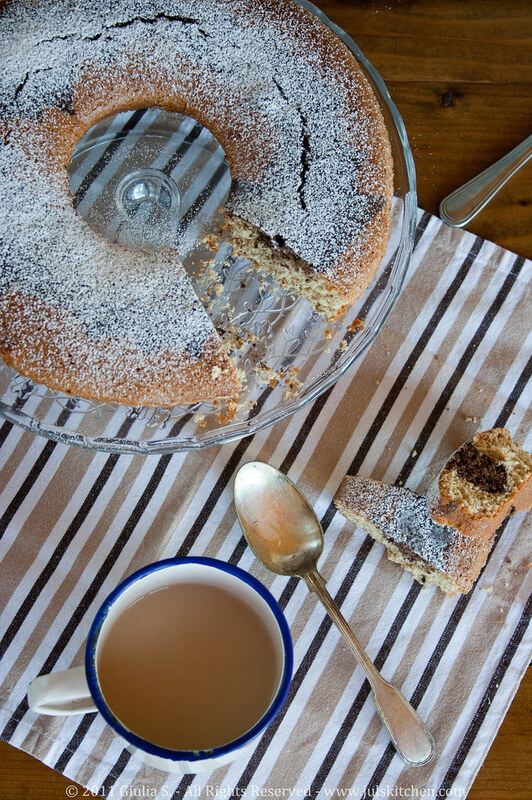 I love every aspect of this cake, from the spongy and crumbly texture, born to be soaked in a large cup of milk or tea, to the crunchy crust, powdered with sweet icing sugar. This is the first cake I have ever mixed and baked under the smiling eyes of my mum, during endless fall Sunday afternoons, foretasting the Monday breakfast. Do you have enough time to indulge in your breakfast rituals? 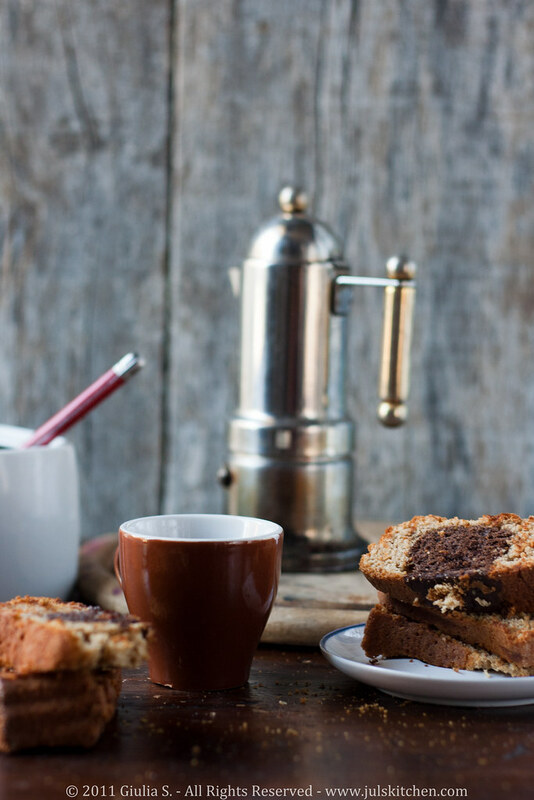 Slice the ciambellone, spread it with your favourite jam and soak it into caffellatte, a generous cup of warm milk and coffee, one of the most typical Italian breakfast drinks, a close second of cappuccino (made with the foam of whole milk and coffee). Are you in a hurry, which happens most of the time? 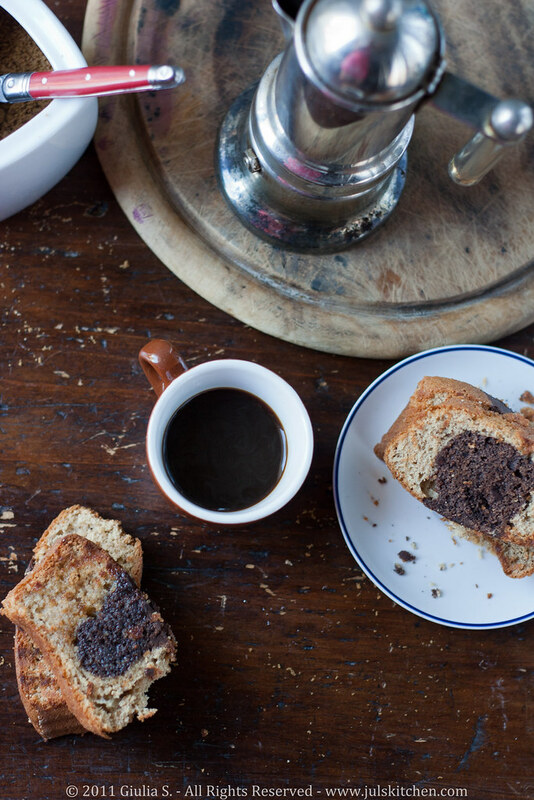 Just grab a slice of ciambellone to munch on while savouring a cup of strong espresso or moka: yes, savouring even if you are in a hurry, because coffee is a pleasure, and I do believe you can always carve out a minute to indulge in a cup of coffee, made by the book. I like it dark, unsweetened, with a remote hint of roasted cocoa beans. After a few days, the ciambellone can get stale, do not panic! Just toast thick slices of it and have them spread with butter and a sprinkle of cane sugar, a perfect match to the nutty flavour of the spelt flour, my favourite cereal so far. Beat the egg yolks with the sugar with an electric mixer, until light and pale yellow. Beat in the yoghurt and the vanilla extract, then sift in the flour, the baking powder and a pinch of salt, then mix until smooth. Beat the egg whites until stiff picks form. Fold them into the cake batter. Butter the base and sides of a ring cake tin about 20 cm large and pour in 2/3 of the batter. Sift into the remaining batter the cocoa powder and pour it over the cake. Bake in the oven for about 35 minutes, until golden brown. Let it cool completely on a wire rack before dusting generously with icing sugar. Wow that's a perfect looking moist cake. Keep up the good work guilia. Appreciate kulsum on the guest post space. GOR.GEOUS. photography! I'm licking the screen. Not good. Wow looks delicious... I haven't had breakfast yet - wish this is my breakfast. Thank you Kulsum for introducing Giulia! I'm a cake for breakfast girl all the way so I am so happy to have this authentic Italian version. It's beautiful as well. The photos make me want to pull up a chair. I can't wait to explore Giulia's blog! That's it. I'm making this. It's beautiful and sounds scrumptios! I love your coffee pot in the background too. Looks great! Great guest post! thank you Kulsum for having me here with my guest post and to everyone for your nice comments! Hello my friend...hope you are enjoying in India.Take care. The ring cake looks amazing! I love Giulia's blog ever since I found it..she has yum recipes from freshest ingredients. Sounds like a wonderful breakfast, especially sliced with jam on it and dipped in tea. I could eat that for breakfast every day. What a gorgeous cake, it looks absolutely scrumptious!!!! This is the second breakfast cake recipe I have seen today. Sounds like the breakfast Gods are trying to tell me something! I love this post, Juls and all her recipes! This one with yogurt is amazing...love it! just landed here from Giulia's blog and I must thank her, because I really like it here! I am Italian as well and I confirm what she says: that's really a typical breakfast (I prepared a ciambellone for breakfast myself yesterday, for tooday's breakfast). 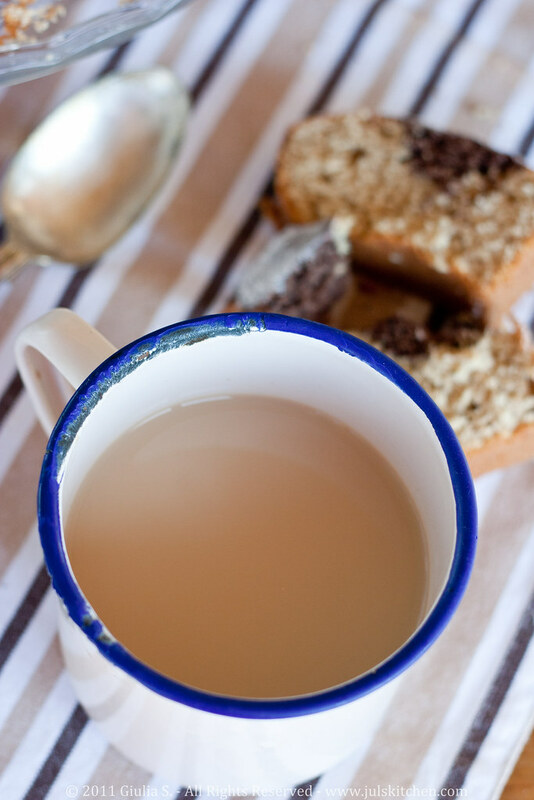 Love the pictures, especially those with the old-fashioned mug. Look at how beautiful the bread ring is with the hints of chocolate in the middle/center. I love it! 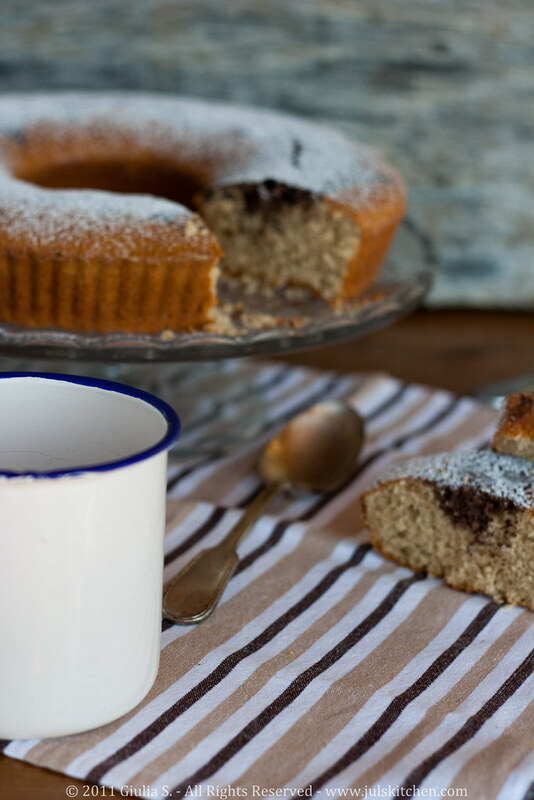 Great use of spelt flour and I can only imagine how amazing it tastes! I am a Love cake for breakfast kind a person and this is warm and beautiful. Love to see Giulia here! Enjoy your holiday! Hope you are stocking up on a lifetime of delicious food. Great post by Giulia! I'm so glad I found this recipe! I used to visit italy every summer with my family, and our neighbour would always make one of these cakes for us when we arrived. I love the marbled effect of the light and dark cake together, and just looking at the photos takes me back there :-) Thanks for a fab post. Awesome post and brilliant pictures. I am a big fan to Italian cuisine and glad to have found her blog. I am hoping over to her space to read more about her. Just lovely! Makes me want to linger at the table over a cup of coffee with my best friend and chat all day.. I've been seeing a lot of spelt flour lately. This cake looks healthy AND delicious. Great pictures too! Nice pictures. They seem like they were taken by a professional food photographer.